Kinetic Ginseng is made from the whole roots of Panax Ginseng by a unique patented bioconversion technology to produce ginsenoside metabolites. The dominant active components of ginseng are saponins (ginsenosides). Orally administered Ginseng saponins are not decomposed by digestive enzymes, so they pass through the stomach into the intestines intact. Saponins are hydrolyzed byintestinal bacteria and then the "metabolites" are absorbed through the intestinal wall into the blood stream. Recent research has shown that individual differences of ginseng efficacy between individuals and between different ginseng products is due to differences in the hydrolyzing ability of human intestinal bacteria. Kinetic Ginseng (fermented Korean red ginseng) has already been pre-hydrolyzed by fermenting with appropriate probiotic bacteria. 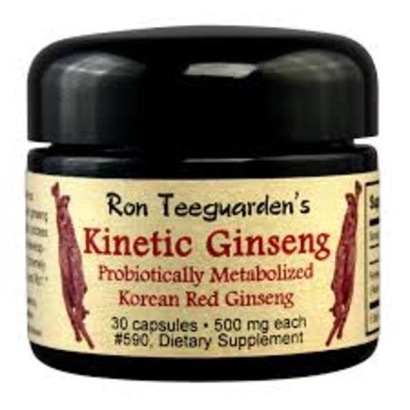 As a result, everyone consuming Kinetic Ginseng can expect equal efficacy from the ginseng. *This is the first and only ginseng product in the world that is assured of complete assimilation by the human body. This is a huge breakthrough in herbalism. In recent years, many people have been unable to fully digest and assimilate ginseng because they do not have the appropriate digestive bacteria in their gut. This pre-digested, fermented ginseng eliminates the need to digest the ginseng within the human gut. It has already by "pre-digested." As soon as it reaches the intestines it is ready to absorb, and will be absorbed. The organism used to ferment the red ginseng is known as Hideo Hasegawa A22. It was originally developed in Japan. It is very similar to Prevotella oris strains that were originally isolated from the human gut and identified as the major bacterial species possessing the ability to hydrolyze (digest) ginseng. Many people have had the Prevotella oris strain eliminated by antibiotics. Kinetic Ginseng is extremely efficacious. Research at major institutions in Japan and Korea found that fermented ginseng (e.g.,Kinetic Ginseng) is a tonic for restoring the body's natural balance and for maintaining homeostasis. Asian researchers believe that Kinetic Ginseng enhances body strength, supports cognitive functions, and has bi-directional adaptogenic activity (supports the body's natural balance and ability to withstand stress). Kinetic Ginseng is a wonderful ginseng product that can benefit anyone. It is 100% assimilable and provides a full range of ginseng saponins. Ginseng contains several unique active ingredients that are not found in any other plants. The most important substances with bioactive properties are called ginsenosides. Chemically, several ginsenosides exist and are classified in different groups, all of which contain an "R" in their names. Each ginsenoside has its own special properties and effects. There are two dominant types of ginsenosides: Rb (Diol type) and Rg (Triol type). The interplay of these two ginsenoside types creates the harmonic balance between Yin (passivity, darkness, slowness) and Yang(activity, brightness, quickness). Diol type saponins are Yin. They have the ability to calm the human organism during times of stress and agitation. Triol type saponins are Yang. They, on the other hand, increase performance, and speed up reactions. As a result of these two interacting but opposing effects, Ginseng tends to regulate functions in the body. It is therefore neither stimulant nor sedative – it is both, or either, depending upon the needs of the body and mind under different circumstances. This "bi-directional" action makes Ginseng an adaptogen, a substance that automatically helps restore and maintain balance in the body and mind, and reduces the stress response of both the body and psyche. The active components of Ginseng, as described above, are ginsenosides. Orally administered ginsenosides (e.g., raw or extracted ginseng dietary supplements) are virtually unaffected by either gastric juice or liver enzymes. Amazingly, the absorption rate of ginsenosides through the intestines is very low. If you don't have the right bacteria in your intestines, the Rb and Rg ginsenosides usually just pass right through the body. However, if the ginsenosides are hydrolyzed by certain intestinal bacteria, then the metabolites are absorbed into the body. Therefore, an individual can expect maximum ginseng effectiveness only when specific intestinal bacteria exist in the body which hydrolyze the ginsenosides, enabling the body to use the ginseng. Fully mature Korean Ginseng that has been steamed to convert it to red ginseng, contains the most ginsenosides of all commercially produced ginseng. Korean red ginseng contains more than 30 known ginsenosides. 18 of the ginsenosides in Korean red ginseng are of the Diol Type and are thus Yin in nature.11 of the ginsenosides in Korean red ginseng are of the Triol Type and are thus Yang in nature. Red Ginseng not only contains Rg and Rb ginsenosides, but also other forms, known as Re and Rc, as well as others. These too require bacterial metabolizing to make them absorbable. These are also metabolized in the process of making Kinetic Ginseng, making all the ginsenosides in Ginseng bioavailable. Note: inexpensive ginseng products, such as might be purchased at most health food stores and convenience stores, are made from less mature roots (immature, by Dragon Herbs standards) and have an awkward balance of ginsenosides that makes the Triol Type (Yang) ginsenosides the dominant component. We highly recommend never consuming this cheaper grade of ginseng product. The balance is wrong and unhealthy. The ginsenoside-hydrolyzing (metabolizing) ability of intestinal bacteria varies from person to person. These differences exist, in part, based on a person's physical condition and the varying patterns of intestinal microorganisms that exist in a human body. Antibiotics kill off the precise microorganisms that metabolize ginseng. Anyone who has taken an antibiotic may be lacking partially or entirely in this or related microorganisms. Therefore, many modern people cannot get the full benefit, if any, of ginseng. And that's where Kinetic Ginseng comes in. Kinetic ginseng is equally effective in all people, regardless of their ability to metabolize ginsenosides. Kinetic Ginseng is fermented during the manufacturing process by a microorganism that metabolizes ginseng. This vastly improves the effectiveness of this red ginseng over any other ginseng product in the market simply because of the improved assimilation of the ginsenoside metabolites that are actually functional in the human body. 1 - 6 capsules a day as desired. 30 capsules 500 mg each.